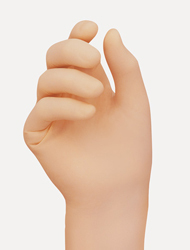 Protegrity® Micro SMT synthetic gloves are designed for procedures requiring extra dexterity and total precision. These gloves are created with the same Protegrity® triple-bonding process and SMT finish, but they have a lighter touch for precise tactile sensitivity. Their natural rubber latex outer layer provides a soft feel, high tensile strength and good elasticity. The inner layer is nitrile (nonlatex), which provides effortless donning as well as outstanding durability and protection. The specially formulated middle layer is a blend of nitrile (nonlatex) and natural rubber latex that enhances the adhesion of the inner and outer layers. 12" average length; 7.1- mil average finger thickness.